New Missouri-specific research finds that the growth in opioid abuse in the state parallels an alarming upward trend in newborns — neonatal abstinence syndrome. Researchers from the Hospital Industry Data Institute reviewed hospital diagnostic codes for all Missouri births between 2006 and 2016, and found a 538 percent increase in codes related to newborns with withdrawal symptoms stemming from maternal drug use. HIDI research released in October 2015 showed a leveling off of hospital and emergency department visits between 2012 and 2014. The updated data identifies a new spike in hospital utilization between 2014 and 2015. Missouri Rep. Holly Rehder of Sikeston, has introduced legislation to establish a prescription drug monitoring program to assist providers in identifying prescription drug abuse. National research mirrors the Missouri data. 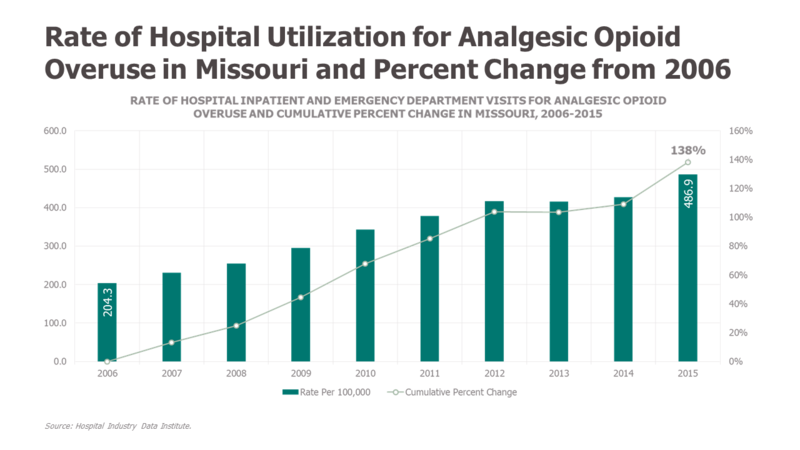 Between 2009 and 2014, Missouri followed only Tennessee in opioid-related adult inpatient stays, and Illinois for opioid-related emergency department visits, among its neighboring states. In both categories, Missouri exceeded the national average for cumulative percent change. Growth in opioid utilization is seen among all payer types. 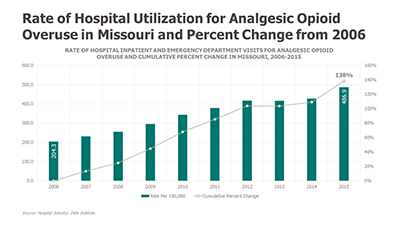 The highest rate of growth in Missouri for hospital utilization related to opioid abuse was in individuals with Medicaid coverage and among the uninsured. 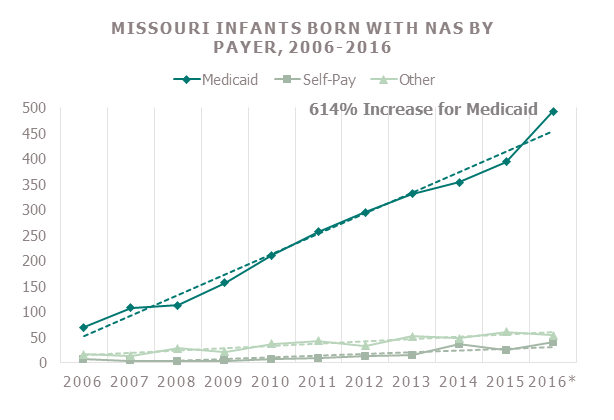 Policymakers have a significant stake in the effort to reduce opioid abuse among Medicaid enrollees — more than 40 percent of births in Missouri are funded by the state’s Medicaid program. These children are automatically Medicaid eligible. The new research shows that total hospital charges to Medicaid for infants born with NAS topped $20 million in fiscal year 2016. The cost to Medicaid was nearly $10 million. The research does not calculate other downstream costs, such as follow-up clinical services or social services such as foster care or long-term health consequences of being born with NAS. These additional costs will add to the financial impact of this problem. 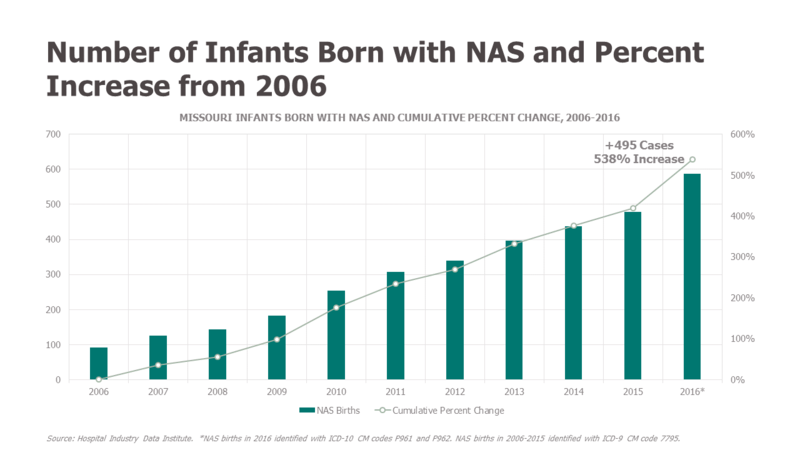 Although the number of births in Missouri declined slightly throughout the last decade, the number of newborns with NAS increased — from approximately 1 in 1,000 in 2006, to nearly 8 in 1,000 in 2016. 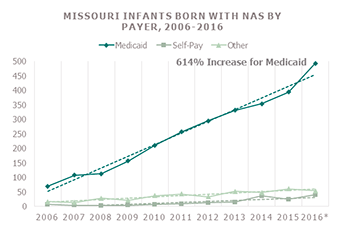 The rate of increase for NAS-affected newborns in Medicaid between 2006 and 2016 was 614 percent. 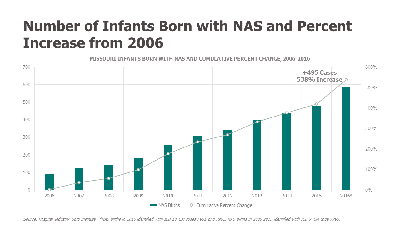 The increase in Medicaid NAS-newborns accounted for 86 percent of the total statewide increase throughout the decade. The statewide rate of births with NAS in 2016 was 7.9 per 1,000 births. The rate among newborns covered by Medicaid was nearly double the statewide rate at 15.2 percent. In December 2015, six organizations representing Missouri health care providers issued recommendations to their collective memberships on an initial step to reduce opioid painkiller misuse and abuse. In addition, several municipalities have adopted local prescription drug monitoring programs. Changes to both practice and policy are needed to address this epidemic. Rehder’s bill, which has bipartisan cosponsors in the Missouri House of Representatives, is HB 90.